A car breakdown can range from mildly frustrating to downright life-threatening, depending on the location and circumstances. Experiencing a flat battery on your way to work and ringing up Roadside Assistance is one thing; breaking down on a desolate outback track with insufficient spare water is another matter entirely. The inconvenience of a misbehaving vehicle is always magnified in direct proportion to the nature of your destination. Probably the most stressful car breakdowns occur when you’re on your way to the airport to catch an international flight. Can you get your car fixed or towed away, then get hold of a taxi in time to still catch that plane? Often, the answer is no – and your travel plans suffer. Another tricky breakdown moment is when you’re transporting an expectant mother to the hospital. Babies have been born in the back seats of cars, but a hospital is definitely your first choice! Missed business or medical appointments, vital job interviews and first dates can also be ruined because of unexpected car problems. Why has your car broken down? Cars break down for all sorts of reasons and you can’t foresee every possibility. However, the best antidote to car breakdowns is preparation. The vast majority of breakdown issues are thoroughly preventable. Flat or faulty batteries are a major cause of car problems. If you’re lucky, you may get 3-5 years from a new car battery. Sometimes, you might only get a year. Have your battery tested for charge twice a year. You’ll stay ahead of any issues and keep an eye out for dodgy clamp connections and corroded terminals. If your battery requires regular electrolyte top-ups, don’t forget those. Your car’s tyres are literally ‘where the rubber meets the road’, so make sure you look after them. Steer clear of debris on the streets, maintain the right air pressure and don’t let tyres get too bald. A tyre blowout or a fine from an eagle-eyed policeman conducting a road safety stop will pick this up. Keep your spare tyre in good condition too. If you’ve never changed a flat tyre in your life, that’s okay – now is the perfect time to get in some practice so you’ll be ready when the time comes. If you’re like most people and someone asks you how your alternator is performing, your most likely response will be “What’s an alternator?” However, these cantankerous gizmos can play up pretty regularly in vehicles and it’s worth knowing how to spot a dying one. Usually, a red light on your dashboard is the first hint that your alternator is failing. If your headlights start dimming for no apparent reason or there is other evidence of quick loss of electrical power (or rising engine temperatures), those symptoms are a clue as well. If any of these things happen, it’s time to get your alternator checked out by a mechanic as soon as possible. The best way to keep car breakdowns at bay is to have your car serviced regularly, keep fluids topped up, look after your tyres and respond to any maintenance issues early – before they become a threat to your car’s basic functionality. Charged mobile phone – this is crucial so you can summon help, check your GPS location, locate the nearest service station. Car Charger- It’s worth investing into a good phone charger. Car-based USB chargers can keep your phone running. Where have you broken down? The most convenient place to break down is in your own driveway. Some of the diciest spots include the middle of a bridge, a narrow road with little or no shoulder, a busy motorway or just about anywhere during rush hour. A remote area is problematic too. You generally don’t have a choice about exactly where your car chooses to conk out. But where possible, try to find a stopping place that’s well away from the traffic flow and out of danger. Get out of your car only if it’s safe to do so – you may have less room to move around outside than you think. When you have to stop, keep in mind how visible your stranded vehicle will be to oncoming traffic, which may be approaching at speed or from around a bend. Whatever your breakdown situation, be aware of the danger of being rear-ended by traffic that comes up on you at the last moment. 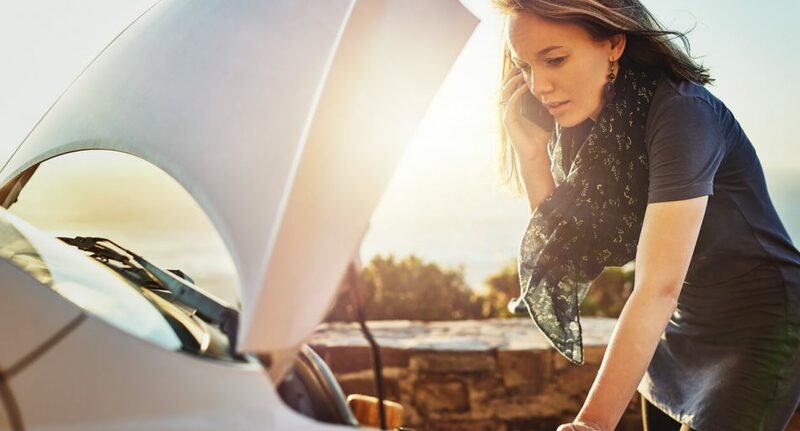 It’s worth investing in Roadside Assistance too – it’s surprisingly affordable and can be a huge help when things go wrong out on the roads.